Please bookmark this page as http://www.pobox.com/~gsutter/no-msie/. Other URLs will become invalid very soon. Turn off that godawful sound! Microshaft has been made aware of a security breach in Internet Exploder 3.0 and 3.01 for Windows 95 and NT 4.0 that was reported on an obscure Web site, somewhere out there amidst the chaos. With help from one of our employee's kids, we have isolated the issue and have a solution that is currently in testing. At this time Microshaft expects to post yet another patch that users can download to protect their computers from everybody except us within 48 hours. We have not had any customer reports of this problem to date, as all IE users' email software was deleted through malicious exploitation of this bug. Lusers running Internet Exploder 3.0 and 3.01 for Windows 95 and Windows NT. It does not affect lusers of Internet Exploder 3.0 / 3.0a for Windows 3.1 or Internet Exploder for Macintosh 2.1 / 3.0 / 3.0a. How serious is it, and how can lusers know if they're at risk? Any lusers running Internet Exploder 3.0 or 3.01 for Windows 95 and Windows NT are definitely at risk. Webmasters would have to purposely create malicious code in order to enable the threat. However, since everyone on the Internet worships Microshaft, this just won't happen. What is Microshaft doing to ensure this type of problem doesn’t occur in the future? Microshaft makes it a policy to insufficiently test its software before posting code to the Internet. That being said, there will be occasions when even Bill's machine crashes. The safety of our customers is our number four priority (after 1. making tons o' money, 2. glorifying Bill, and 3. putting other companies out of business), and we will work from 10:30 to 11 A.M. each Thursday to find a solution. The Microsoft Boycott Campaign's page describing another MSIE 3.0 and 3.01 bug! I received a great letter from a "fan". Take a look, I'm sure you'll be amused. If you're looking for the Hamlet monologue from Apple that was here, it has moved. "Have no confusion in your head: Job one for us right now is the Internet and defeating Netscape ... They're simply our smartest competitor." Bill and Co.'s immoral, hopefully illegal business practices and unstable, bloated products have somehow (through lies?) come to dominate the PC market. One of the few exceptions to this is the Internet Exploder. 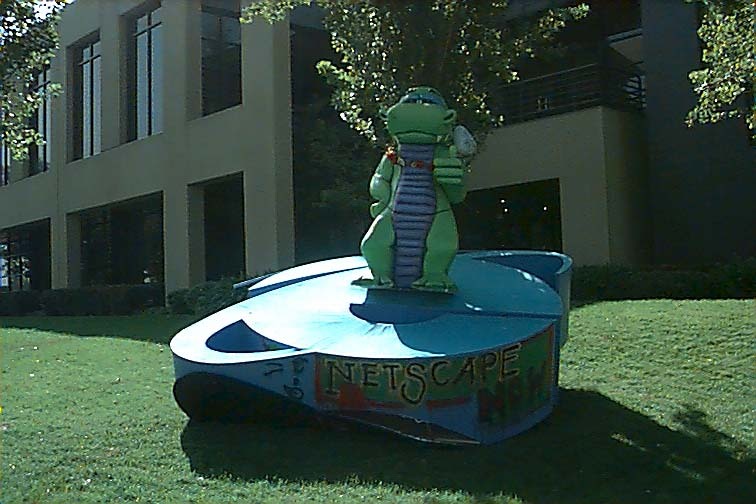 Netscape maintains the lead in the web browser market through sheer persistence (and a better product) as Microshaft does their damnedest to destroy them. Microshaft has had more people working solely on the Internet Exploder than Netscape has total employees. Internet Exploder users CANNOT read this paragraph! The bgcolor is the background color for the marquee. width sets the width. I have mine set to 20% of the browser width. loop sets the number of times the marquee will repeat. The number of pixels scrolled between each time period scrolldelay is set by scrollamount. Finally, direction makes the marquee scroll either left or right. For those of you actually using MSIE, click here and whine on home. I know you want to get <a target="_self" href="http://www.msn.com/">shafted</a> today. This Anti-Microsoft Webring site is owned by Gregory Sutter. Want to join the ring?. The guy with the original <marquee> insights! An insightful page with the latest industry news. Any Ziff-Davis article ripping Microsoft is one for the books. Bill Gates@NBC-It's Must C:\ TV! This page is a work of parody. Windows and Internet Explorer are trademarks of Microsoft Corp.